April, 1912: The RMS Titanic sets sail for her maiden voyage with more than 2000 people aboard. Among the passengers on the "Queen of the Sea": a wealthy book collector with a rare and valuable volume, a cunning thief desperate for money, and a young steward looking for a chance to be a part of something great. 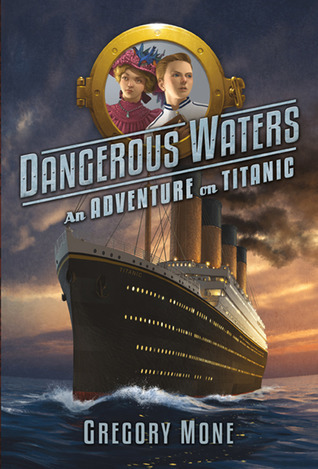 With the centennial of the shipwreck approaching in April of 2012, new Titanic books are hitting the shelves. It is one of those topics (like Amelia Earhart's disappearance or dinosaurs) that kids ask about again and again, endlessly fascinated. In this fictional take for middle grade readers, Mone skillfully blends real-life historical figures with his own characters. An Author's Note at the end explains that Harry Widener really was a book collector who perished on board the ship, while young Patrick and the other main characters are the inventions of the author. From the taste of coal dust to the color of a partially-cleaned spittoon, the narrative is packed with rich sensory details, bringing the sights and sounds and smells of the scenes to life. Mone uses playful language in his descriptions; in the first chapter, he says of the thief Berryman that "the local baker refused to loan him so much as a roll." Quick-paced action keeps the pages turning as events come to their inevitable conclusion. In addition to the drama of the collision, Mone intrigues readers with a mystery that is just a little bit reminiscent of Dan Brown. The perspective shifts between sweet Patrick, who can't help but follow his own sharp eyes and ears, and the thieves after something they think will bring them untold riches, if only they can decipher a coded message within. The reader, of course, knows more than any single character, and hints are offered about the secret message before its meaning is finally revealed. Sign into Goodreads to see if any of your friends have read Dangerous Waters. 13.45% "I think this could be a fantastic audiobook, as long as the narrator could do a *really* good Irish accent."